After Algeria rejects his body, Mohamed Merah is buried outside the city of Toulouse. 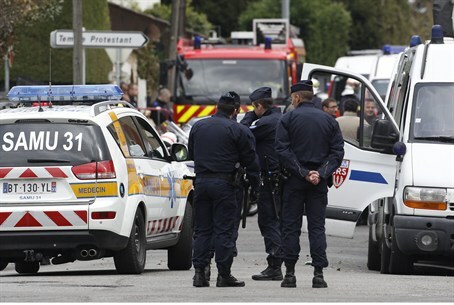 Mohamed Merah, who killed seven people in south-western France including four Jews in the Otzar Hatorah school, has been buried outside the city of Toulouse, the BBC reported. Merah, 23, was shot dead after a 32-hour siege at his home last week. He was buried at the Cornebarrieu cemetery in the city, several hours after Toulouse mayor Pierre Cohen raised objections to his being buried in the French city where he committed his crimes. "Following Algeria's last minute refusal to accept Mohamed Merah's body, Pierre Cohen feels that his burial within the city of Toulouse is inappropriate. So he has asked the regional prefect to delay the burial 24 hours," city hall said. President Nicolas Sarkozy, however, said he wanted Merah to be buried in France "without argument". “He was French. Let him be buried and let's not have any arguments about it," Sarkozy told BFMTV news channel in a bid to put the tragic episode that has eclipsed his re-election bid to rest. A police helicopter hovered overhead and around 100 policemen were present at the funeral, according to French newspaper Le Figaro. Merah's body was accompanied by around 15 men, although it was not clear who they were, the newspaper said. On Wednesday, Merah’s lawyer said his client was suffering “psychological difficulties” after separating from his wife days before the attacks, his lawyer said Wednesday. Attorney Christian Etelin claimed his client was a “lone wolf” with no organized crime or terrorist connections and was “an abandoned child” angry at a long-absent father. French politicians have described Merah as an isolated killer but police are searching for potential accomplices, the report said. Merah's brother is already in custody, suspected of helping prepare the attacks. While his family was working to find a place willing to accept his body for burial, Merah's father was making arrangements to sue French police for having put an end to his murderous shooting spree.